South Korea's impeached president, Park Geun-hye, is due to find out whether she will be permanently removed from office. She has been suspended from official duties since parliament voted to impeach her in December. 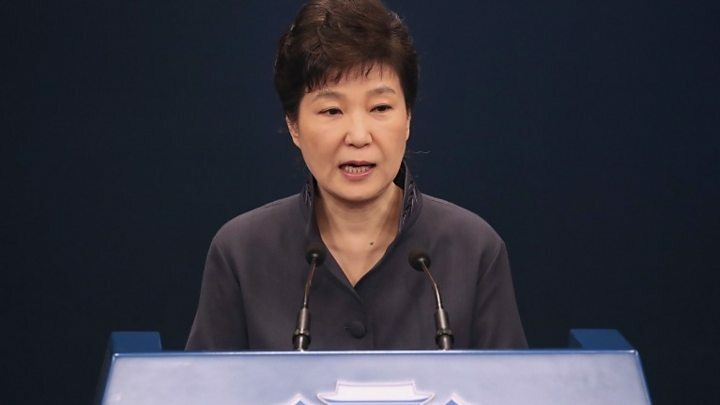 South Korea's constitutional court has begun delivering its verdict on whether the president should lose her seat in office or be reinstated. The hearing is expected to last for about an hour. If the dismissal is upheld, it will be the first time a democratically elected president has been removed from office in South Korea. A presidential election will be held within 60 days. Protesters both against and in support of Ms Park are outside the court building, where security is high. As long as she remains president, she is immune from prosecution. Who is the Samsung boss involved in the scandal? 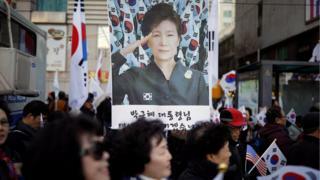 The political scandal involving Ms Park and an old friend of hers, Choi Soon-sil, has rocked South Korea, sparking regular huge protests. In a written statement on Monday, Ms Park against said she was innocent of the charges but had "belated regret, that I should have been more cautious with my trust in her [Ms Choi]". Ms Choi is accused of using her presidential connections to pressure some of South Korea's biggest companies into giving millions of dollars in donations to two non-profit foundations she controlled. She has been charged with various offences, including abuse of authority, coercion, attempted coercion and attempted fraud, leading to the wider investigation. Ms Park is accused of giving her friend unauthorised access to government decisions and allowing her to exploit their close relationship. The de facto head of Samsung, Lee Dae-jung, went on trial on Thursday for his alleged role in the scandal. He denies that he gave donations worth 41bn won ($36m;£29m) to Ms Choi's foundations in exchange for government support for a Samsung merger. Mr Lee has admitted to giving the money, and says he regrets it, but denies seeking favours in return. Did a puppy bring Park down?